For just £7 per child there will be a grotto with a gift, disco, children’s buffet and so much more! Contact Hazel Anderson on hazel@spider-ede.org.uk to book tickets. To continue with Edie’s legacy we will be raising funds with The Bradley Lowery Foundation for the research of DIPG and also offering support to North West families that go through the heartbreak and devastation that we have. We are holding a Christmas Craft Fair on Saturday 1st December from 11am, at St Joseph’s social club, Greenbank Road, Birkenhead. With a variety of craft stalls selling handmade goods, Santa’s grotto and a carwash service (weather dependent) will be available too. On Friday 11th May, Edie’s 11 vs Hollyoaks cast played at Ashville Football Club in Wallasey. Edie’s 11, (managed by Edie’s uncle Joe Sephton and cousin Kev King) are a group of local lads who are close to Edie and her family, or have been heavily involved in fundraising and holding their own events in aid of the Spider-Ede Appeal. 8 members of the Hollyoaks cast played along with crew and friends to make up the numbers. One well known name was I’m a Celebrity 2017’s Jamie Lomas, who previously played Warren Fox in the soap. It is safe to say the fans were thrilled when he pulled up to Ashville FC and happily got some photos and signed some autographs! Another well known cast member, Nic Pickard, was also present. Nic plays Tony Hutchinson and is the longest-serving cast member and appeared in the first episode in 1995. Nic played a massive part in helping to arrange the match and we could not thank him enough for his help. Duayne Boachie, who plays Zak Loveday, was the Spider-Ede Appeal’s Man of the Match. His football skills were just as good as his acting skills and the award was well deserved! Both Duayne and Parry Glasspool, screen name Harry Thompson, proved a hit with the fans and couldn’t get to their seats without having a queue of ladies requesting a photograph. Luke Jerdy was one of Hollyoak’s star players, who is best known as Jesse Donovan in the soap. David Kennedy, who plays Dirk Savage, also took part. It didn’t go un-noticed that he enjoyed the delicious curry at the end of the match more than he enjoyed the game! The full time score was 6-4 to Edie’s 11 who proudly took home the winners trophy. The trophy was presented on the night to Ian McGraa and Lee Gibson, both local rival Sunday league football managers who chose to wear the opposite football shirt in the evening for sponsorship, to raise more funds for Edie’s treatment. Our officials on the day were Aidan Jones, Steve Copeland and Merril Grundy, who kindly donated their Friday night to the charity match. DJ Steve Lord provided brilliant commentary and music before, during and after the match. Liam Kelly was dressed up as Spider-Man to grab photos with the children and adults alike, Louise Lord and Anna Mcallister also brought their amazing cakes to sell, alongside Joan Janvier selling sweet cones and Claire Jardine Jones selling raffle tickets, all to raise additional funds. We’d also like to say thank you to Proactive Personnel Ltd, Neil Hayes Painting & Decorating, Haworth and Gallagher Solicitors, and AquaSafe Swim School for their sponsorship towards the event. The night was a success and we raised in excess of £2500! Keep your eyes peeled for the return of Edie’s 11 in their next football match! View all photos from the evening on Flickr. 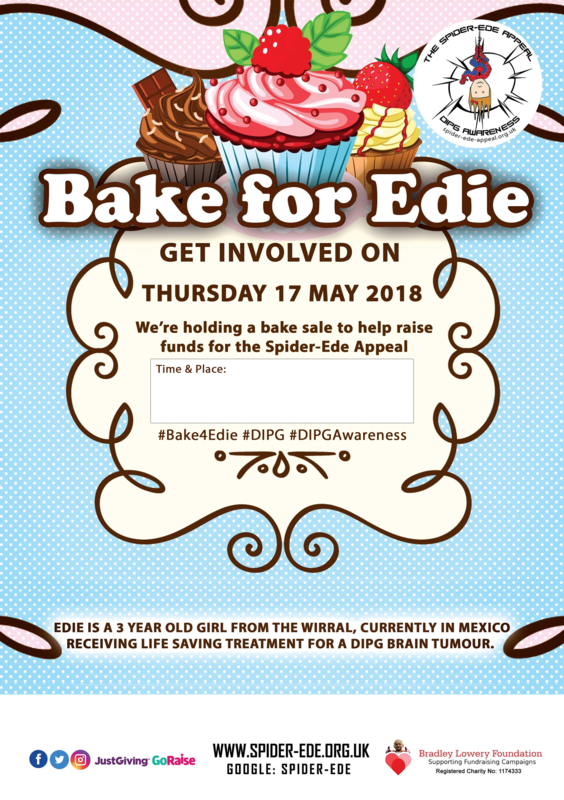 On 17th May, we’re holding our second #Bake4Edie event, asking businesses, organisations, schools and stay at home worker’s/parents to hold or get involved in a cake and bake sale to help raise funds and awareness of DIPG. For more information on D.I.P.G. and why we’ve chosen this date, please view our D.I.P.G. Awareness Day post. Last time we reached our target of £5000! Please help us beat this on the 17th May! Feel free to print off and use the poster below to get your friends and co-workers involved too, and don’t forget to post your photos and tag them #Bake4Edie, or comment below and let us know you’re taking part!